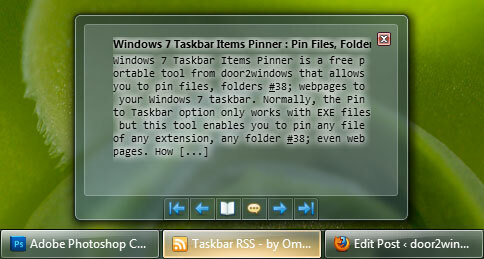 Taskbar RSS is a free portable tool that allows you to read RSS Feeds from your taskbar in Windows 7. Download the tool and extract the archive. Type the feed URLs that you want to read separated by lines. Run RSS7.exe from the downloaded archive. To read the RSS feeds just hover over the app. You can view the next & previous feed item by clicking on the buttons.